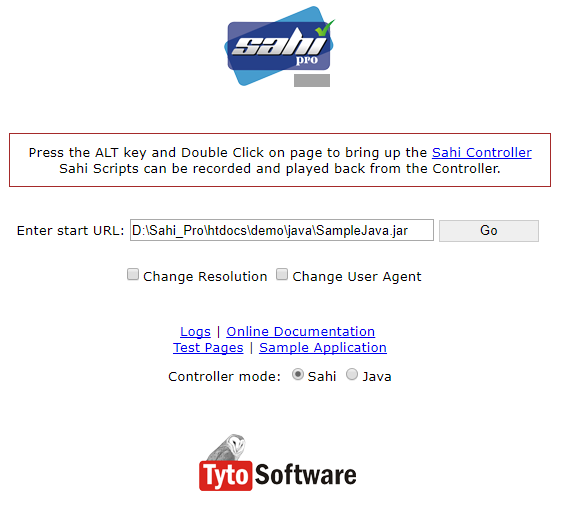 Sahi Pro Desktop Add-on provides support for automation of Java Application. To open Java Application from Sahi browser, Sahi Browser capability should be enabled. To pass arguments to a Java Application at runtime, create a batch file and launch the Java Application from command-line. Enter Java application jar file path in the space provided for "start URL" and click "GO" , to start the application (Download and save the Java plication on local file system before hand). Open a command prompt and cd to sahi/userdata/bin (or click on the "Bin" link on the Sahi Dashboard). (Download and save the Java plication on local file system before hand). (Download and save the Java application on local file system before hand). To use "Evaluate expression" on Java GUI applications, choose "Sahi-Java". To start a Java application _launchJavaApplication($javaApplicationPath) API.